Like no book before it, Preachers of Hate uncovers an ancient hatred that threatens the life and livelihood of every American. The “new” anti-Semitism targets not only Jews, but Americans specifically and the West in general. It targets our values, our lifestyle, and our freedoms. It is the single most important issue we face when trying to make sense of the Arab world. Most Americans will be stunned to discover the depth and extent of anti-Semitic hatred in today’s Middle East and Europe, and that many Muslim leaders are not just encouraging it, but spending a great deal of money to spread the lies that spawned the terrorists responsible for the September 11 attack on America. 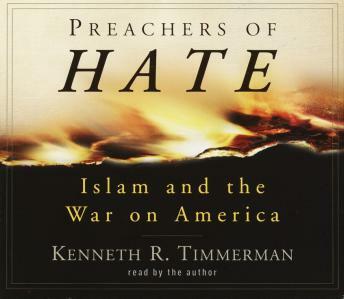 In Preachers of Hate, bestselling author Kenneth R. Timmerman (who is not Jewish) contends that, besides Islam itself, the core unifying force in the Muslim world is a virulent strain of anti-Semitism that postulates the existence of a Jewish conspiracy to take over the world. From the pulpits of fiery Muslim clerics to the Arab street, and to the highest reaches of government and state-sponsored media, there is a belief that this thousand-year-old conspiracy has already taken hold in America and is now, especially after the war in Iraq, about to do the same in the Middle East and beyond. It is seen as no less than Muslims’ historical destiny to prevent such a takeover, and to do so by any means possible. To misunderstand the ferocity of that belief is to vastly underestimate the resolve of many Muslims to repel America, Israel, and all things Western. Timmerman explores the roots of this hatred, examining its history, the religious sources upon which it draws, and how it is being transmitted to young people growing up in Arab societies by their leaders, their teachers, and their mosques. He documents how U.S. and European Union money has been used to finance hatred in Palestinian schools. He exposes the double-talk of Arab leaders and their supporters in the West. As it so often was throughout history, this new strain of Jew hatred is really about much more than Jews. They get attacked first, when the enemies of America can’t attack Americans. However, what begins with the Jews never ends with the Jews. “Is there a conspiracy between America and the Jews?” asks Timmerman. “Indeed there is: A common heritage, a dedication to improving the human condition through compassion and tolerance of differences—a conspiracy of freedom. And that is why they hate us.” As with the Jews throughout history, America has been “unfairly successful.” As have the Jews, Americans have “profited” from the misery and poverty of others. If you hate Jews, you must also hate America. Such is the simple logic of the anti-Semite. Such, increasingly, is the logic of the Middle East. It is a message that is reinforced day in and day out by the official government-sanctioned Arab media, from the streets of Egypt, London, Lebanon, Saudi Arabia, Paris, and Gaza, and in the mosques where impassioned clerics quote verbatim texts like the Protocols of the Elders of Zion, a pillar of anti-Semitic hatred that originated in czarist Russia.